The showroom at Huston and Company displays a variety of furniture, all of which is customizable. Saer cuts wood in the shop (opposite) where he works closely with Bill and the rest of the Huston and Company team. "We have an incredibly talented force. It's a tight-knit community, and I think that separates our shop," says Saer. 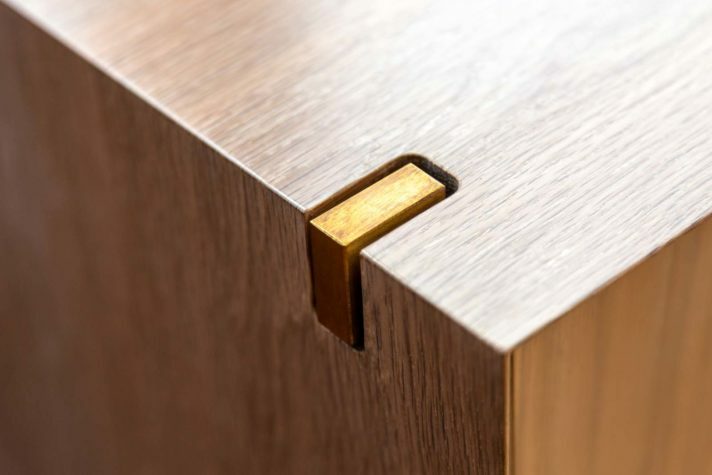 A brass detail (bottom) is crafted into the Newton Sideboard. At Huston and Company, such details embody the design precept of simple elegance. 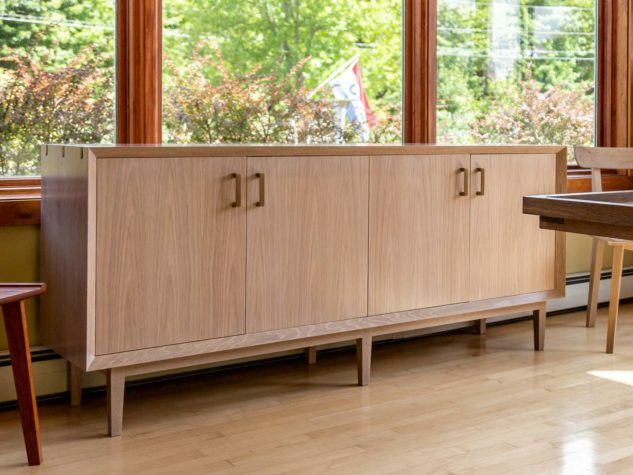 The Newton Sideboard is timeless, and the perfect accompaniment to Huston and Company's dining tables. Bill and Saer Huston of Huston and Company have always had a strong connection with their customers. “We’ve been in business for 30 years now, so we are building furniture for the children of some of our original customers. They come to us saying, ‘We grew up with a table that you made for our family.’ It is generational now,” says Bill. 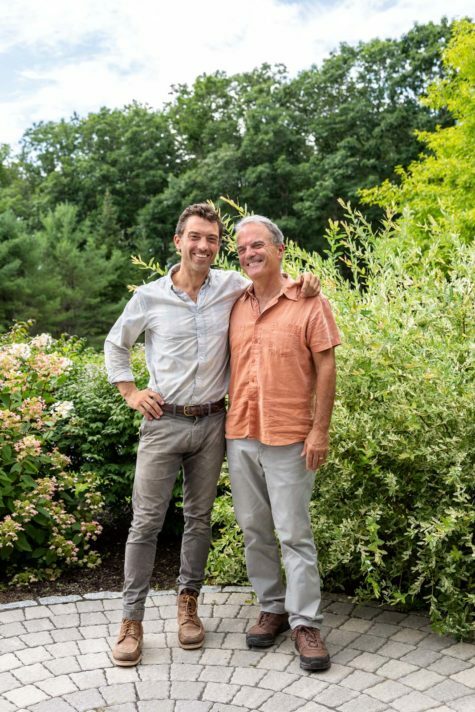 While his original intention was never necessarily to own a business, Bill Huston has found tremendous joy in crafting and keeping long-term relationships with customers—a trait that he has passed onto his son and business partner, Saer. 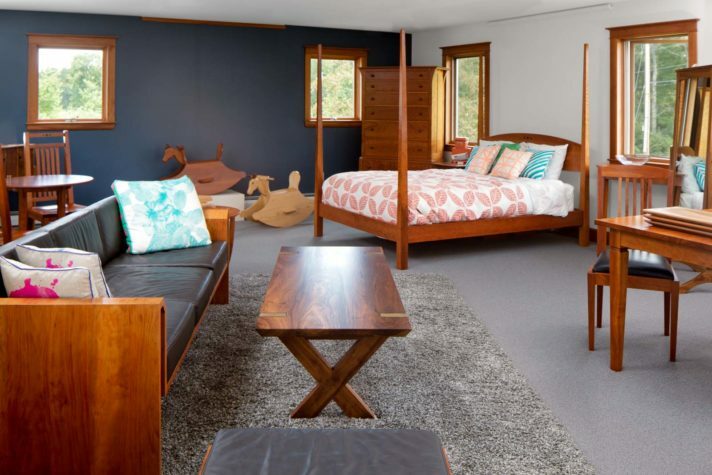 Bill’s passion for making furniture started in the early 1970s. He was studying art in Wisconsin when he learned of an opportunity to attend a furniture-making school in Norway. “It literally changed my life,” Bill recalls. After he spent two years overseas, there wasn’t any more question about what he wanted to do. Bill came back to the United States in 1976 and worked closely with Thos. Moser for the subsequent 12 years. In 1988 he decided it was time to go out on his own. It started off as a one-man shop in Poland Spring, but today Huston and Company employs seven people, with the shop and showroom all in one quaint farmhouse on the out-skirts of Kennebunkport. Upon first arriving, you’re greeted by a stately handcrafted door, a true testament to Huston and Company’s quality of craftsmanship. At Huston and Company, the standard of quality is composed of a multitude of factors, and attention to detail is a critical one. “I’ve always said that, if it’s done well, you don’t even notice it at first,” says Bill. “We’ve had customers call us six months later and say, ‘Oh, I just noticed this.’” Bill and Saer try not to make the detailing in their furniture a focal point. In fact, to them, it’s the combination of details that creates the whole. For some craftsmen, working as a father–son team could create some difficulties, but not for Bill and Saer. “It’s been really enjoyable to develop designs together. Saer and I have been working together for so long that we almost have our own vocabulary. We can say two or three things and we both know exactly what we’re talking about,” Bill says. For Saer, it’s been equally enjoyable. He notes, “We just see each other so much more, which is great. It’s so rare that you get to see your parents more than a couple of times a year.” Bill mentions that he can count the number of arguments on one hand that he and Saer have had since Saer was a baby. In their business partnership, they remain open to and flexible with each other’s opinion. When asked about their specific design style, they both begin to recall several influencers. “A little bit of Shaker, a little Arts and Crafts, a little Asian, a little Scandinavian. I feel like we’ve taken those and we’ve kind of melted them into a form that, at least I feel, identifies as Huston and Company,” Bill explains. Since Saer has joined the team, their design influences have broadened. Bill describes his personal tendencies as somewhat rectilinear, while Saer prefers more organic shaping. This difference in personal preferences has only helped them to become more fluid in their overall design style. 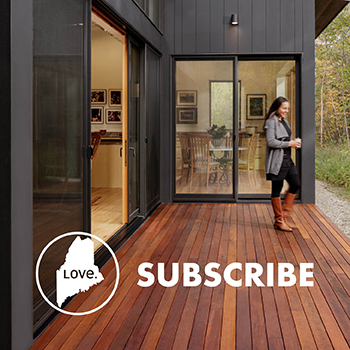 “If you boil it down, we use simple elegance a lot—clean lines. When we’re thinking about a piece, less is more. We try to let the wood speak for itself,” says Saer. 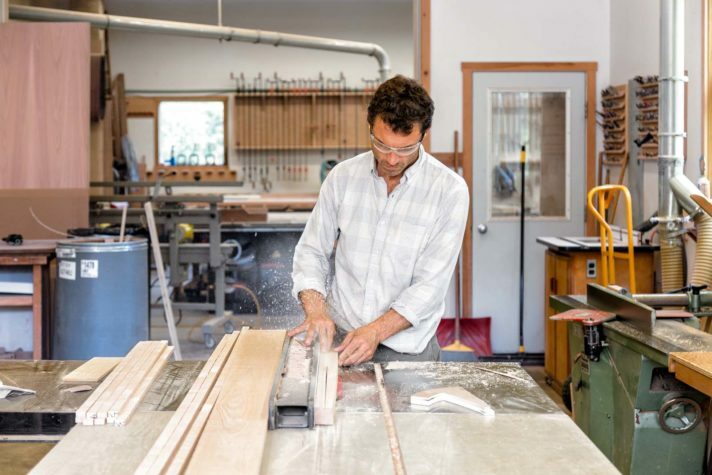 Wood selection is crucial to the outcome of a final product, but Bill and Saer also work to keep their pieces aesthetically classic. They make sure that in 25 years, a piece of Huston and Company furniture will elicit the same appeal as the day it left the shop. Think about how your furniture will be used. Will it be used in a casual or formal setting? What dimensions are you looking for? Will kids be using the piece regularly? Will the piece need to include drawers or shelving? Knowing both short-term and long-term use of the furniture helps ensure that the piece will be practical for years to come. for? This can be the hardest part. Not everyone has a specific design style in mind or can describe precisely what they want. Gather images of styles you like from magazines or online, and take pictures of your favorite pieces in your home. A good furniture maker can work with these and determine a style and design that you will love. do some research on the maker. What is their price range for similar pieces? Don’t be afraid to ask questions and be clear about your budget. Remember, custom furniture lasts for generations. It may cost a little more upfront, but when done right, you won’t have to replace it. When do you need your custom piece? Ask about lead times, and be sure to let your furniture makers know of any special dates that could impact their delivery schedule. If you’re in a rush, let them know. “We are increasingly doing designs together, sharing the marketing, and just kind of sharing everything,” says Bill (opposite). However, when faced with long-term decisions, he doesn't mind stepping back to let Saer decide what’s best. 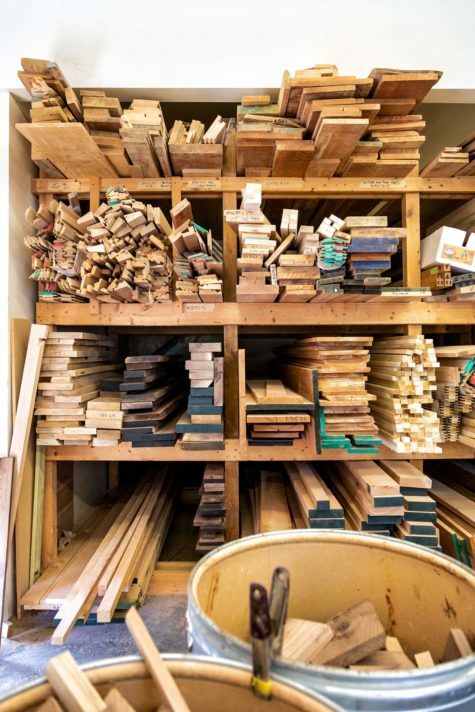 Shelving in the shop (above) helps to keep the wood selections organized. Choosing the right wood for a piece is critical to its final outcome.